Can You Afford Healthy Food On A Per Diem? Per diems can be a smart way for a company to easily manage the cost of food for travelers. Paying the employee per day at a set rate reduces the administrative cost of filing and approving expense reports, a major benefit for companies with a lot of travelers. Plus, per diems allow for easier budgeting. Can Per Diem Meals Be Healthy With Current Per Diem GSA Rates? There are plenty of variables to consider when trying to ascertain the appropriate amount to provide to employees per day. 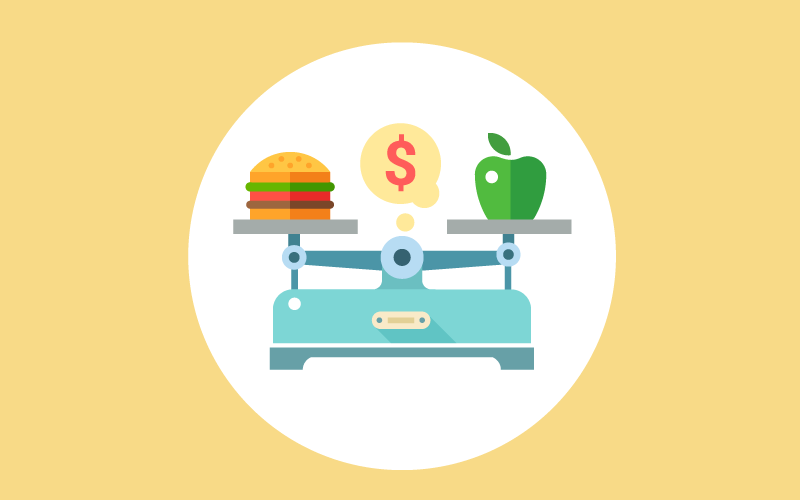 There’s always the GSA, which provides per diem rates based on location, but even those rates can be too little, especially when considering the cost of healthy food, not only in the cost of ingredient, but also in the time to make that healthier food. Of course, some employees will hoard their per diem in an effort to make money off of their travel for the company (and that’s their prerogative). The result is that these travelers are probably not making the best decision for their health, especially if they travel long-term. stresses over the long-term needs of their body and their health. Tips, some good and some bad, for eating cheap while traveling are easy to come by all over the internet. Suggestions for cheap food include taking double advantage of free hotel breakfast by saving a banana, apple, or yogurt for lunch. Other suggestions are stopping by the grocery store to pick up bread and peanut butter for sandwiches or even eating room-temperature beans out of a can. An even worse suggestion is eating off the dollar menu at a fast food restaurant. On the other hand, those employees who want to use their meals & incidentals per diem for its intended use might find that eating healthy on the go can be a real challenge. One suggestion for healthy food on the go that’s often heard is a stop by Chipotle, but eating the same thing for every meal probably isn’t going to work out. According to a 2015 article titled “A Darker Side of Hypermobility,” frequent business travelers get “fewer opportunities for physical exercise, [and have] worse eating habits than when at home.” It seems that travelers are often more concerned with their immediate work-related stresses over the long-term needs of their body and their health. energy to acquire, two commodities they don’t have in excess. The trouble is that healthy food takes more time and energy to acquire, two commodities that travelers don’t have in excess. So, if the company is paying a per diem, it can make sense in travelers’ minds to go for the food that takes less work to get. The challenge of Richards’s suggestion is that paying out more for healthier food will also cost more in administrative costs. It takes extra effort by both travelers and administrators, which seems contrary to the primary purpose of a per diem in reducing administrative costs and time. utility in reducing the impact of business travel on health," says Richards. Plus, how would someone go about reporting which food they ate for a higher reimbursement? And how does a company prevent someone from abusing this policy? And, on an even higher level, what about the issue of privacy? It’s a good practice for employees to make their own decisions about their health and their bodies and for their employers to stay out of it. The notion of rewarding good choices sounds good from a wellness perspective, but there are definitely more possible pitfalls than rewards for any company that takes this approach. Plus, employees who eat healthier food are already reaping the benefits of feeling better overall. In the end, the answer to whether it's possible to afford healthy food on a per diem budget is "yes." However, that "yes" has some qualifications. Finding healthier food takes more time and more work; this means that supporting employees in being healthy might be a matter of reducing the overall stress of the business trip whenever possible. Of course, delayed flights and high-pressure meetings with clients are some major stressors that might not be preventable. However, arranging a schedule that allows employees the time to find and make healthier food along with booking lodging with options for making that food can go far. These are small steps that employers can take in support of their employees' health.